Clive Thompson, in his recent comments on how crowdsourcing has the potential to transform eBooks, refers to a a rudimentary form of crowdsourcing that’s already being studied in print textbooks. The work he’s referring to is by Cathy Marshall, who finds that used-book-buyers place value in the annotations (highlighting and notes) left in the books by previous owners. Thompson had no link to Marshall’s work, so I got in touch with her, to get more details. 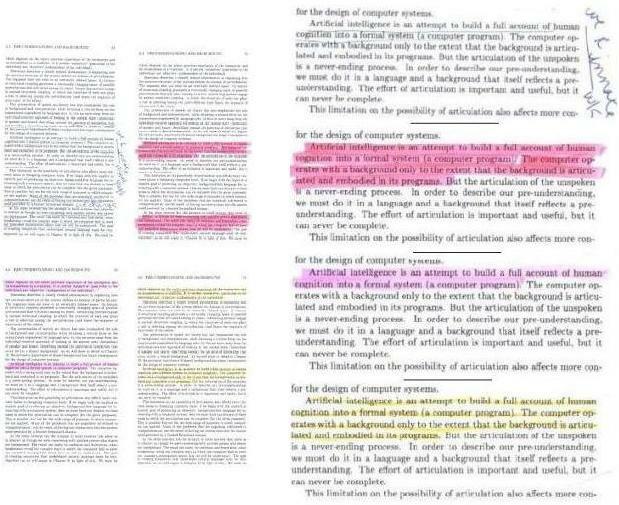 As she describes in her papers (listed below), the motivation for her work is to discover effective methods of utilizing readers’ annotations of eBooks. In her early research, done mostly in the 1990’s, she observed students, and interviewed them, as they looked for used textbooks, to see if they favored books because of the nature of the annotations in them. Kudos to Marshall for this ingenious, basic, application of crowdsourcing to books! It’s great that her little-noticed work, started way back in the mid-1990’s, is finally gaining recognition, as eBooks come closer to reality, and producers look for ways to make them more usable. Marshall, C. Toward an ecology of hypertext annotation in Proceedings of ACM Hypertext ’98, Pittsburgh, PA (June 20-24, 1998) pp. 40-49. Marshall, C. “Annotation: from paper books to the digital library” in Proceedings of the ACM Digital Libraries ’97 Conference, Philadelphia, PA (July 23-26, 1997), pp. 131-140. Posted in eBooks, Marginalia, PicsYes, Uncategorized.